Cash flow is the all-important measure by which Wall Street judges Boeing. Despite any setbacks, the company typically manages to exceed analysts' estimates with maneuvers that can move around hundreds of millions of dollars. Boeing has gushed cash quarter after quarter for more than four years, sending its share price soaring yet leaving some analysts suspicious about how Boeing manages always to surpass Wall Street’s cash flow expectations. Inside the company, too, some are uncomfortable with the financial engineering that Boeing uses to consistently beat cash flow projections, often by $1 billion and sometimes $2 billion. 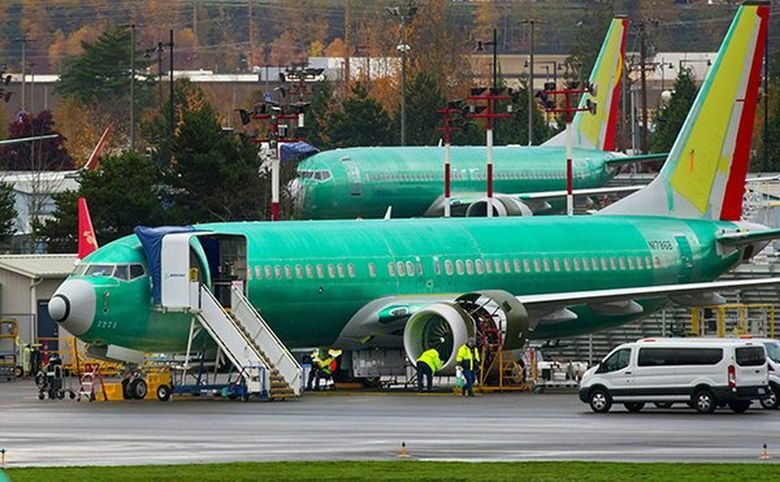 Boeing struggled all last summer to complete the 737s pouring out of its Renton factory as catch-up assembly work and shortages of engines kept it from delivering the planes and collecting its cash. Yet analysts were astounded when it unveiled its financial results in October. “Boeing pulled off another ‘Houdini moment,’ with … an explosive 34 percent jump in cash flow,” analyst Jim McAleese wrote about the $4.6 billion the company said its operations generated. The factory situation improved in the year’s final quarter, though 2018 ended still slightly short on airplane deliveries. When Boeing reported its results Jan. 30, it posted almost $3 billion in quarterly cash flow — shy of the rosiest projections but enough to seal a full-year record total of $15.3 billion. Boeing’s stock price has since risen 11 percent, closing Friday just shy of $405. How does the company manage these “Houdini” moments? The tricks it uses are mundane in procedure, but huge in scale. They amount to various ways of pulling forward cash receipts from airline customers — bringing in cash that’s due in the future just ahead of the end of the quarter — or pushing out the payment of accounts to suppliers into the next quarter. While many companies can massage their cash-flow results, few have as much leeway to do so as Boeing. That’s because aircraft purchases involve such large sums, on payment schedules that are negotiable and adjustable. And the process is entirely opaque from the outside because the precise financial terms of jet sales are never disclosed. Past reports from financial analysts point to very large amounts of cash involved. A company insider, who is familiar with the detailed strategies Boeing uses, said that if the defense side falls short of expectations by hundreds of millions of dollars in a quarter, the call goes out from its Chicago headquarters to the Puget Sound-based Boeing Commercial Airplanes unit with a specific target to close the cash-flow gap: Negotiate with airlines and suppliers to pull money forward, say from January into December, and delay outgoing payments the opposite way. This concerted effort is managed by Boeing Chief Financial Officer Greg Smith in Chicago, the insider said, adding that recently as much as 13 percent of airline customers’ advance payments — amounting to hundreds of millions of dollars — have been pulled-forward payments originally scheduled for future quarters. “Each quarter, our independent auditors review our accounting to ensure that we appropriately accounted for cash in the quarter that we generated it,” Bickers said. “The number one reason Boeing consistently beats expectations for cash performance is that we meet or exceed our plan to deliver airplanes and other products and services with improved productivity quarter after quarter,” Bickers added. He said pulling forward large amounts of cash to exceed market expectations is Boeing’s standard procedure. Boeing negotiates with airlines to pull pre-delivery payments forward from the next quarter. Typically airlines pay about half the actual purchase price in such advance installments, with the other half due upon delivery. Airlines are given some kind of future break in return for accelerating payment. When a jet is finally delivered, the airline that ordered it often doesn’t take ownership, but instead a leasing company buys it and leases it back to the airline. In these increasingly common sale/lease-back arrangements, the lessor pays the full purchase price, which means Boeing must refund to the airline the pre-delivery payments it previously made. For the rush of deliveries at the end of a quarter, Boeing withholds that repayment until after the quarter ends. Upon delivery of an aircraft, various suppliers are owed a cut. For example, GE must be paid for the engines. Boeing negotiates with suppliers like GE, giving them a future break to take their cut of a delivery only after the quarter ends. David Strauss, an analyst with Barclays, said in an interview that airline customers and suppliers don’t go along with these moves out of the goodness of their hearts. “Boeing is giving up something, whether it’s bigger discounts or whatever,” he said. He said such practices are deceptive only if Boeing consistently moves payments around to increase its cash flow, and never the other way. But he said that when airline customers or suppliers get in trouble, Boeing does help them out, either allowing delayed payments or offering financing or advances. For example, Boeing last month reportedly agreed to defer 737 MAX deliveries to India’s Jet Airways, which is in a financial crisis. And Boeing recently signed an agreement with supplier partner Spirit AeroSystems, allowing it for 2019 and 2020 to suspend repayment of 787 advances that Boeing paid Spirit earlier to keep the program going. Still, when it comes to helping out airlines in deep trouble, Boeing may not have much choice. And its concession to Spirit is based on firming up pricing far into the future. In contrast, the techniques it uses to increase cash flow are much shorter term, with no rationale beyond meeting Wall Street expectations. Pearlstein, of Wells Fargo, wrote that Boeing pulled forward the $1.5 billion from 2015 into the final quarter of 2014 after the company’s third-quarter figures had disappointed Wall Street. And he added that a similar trend emerged the following year as airlines United, Southwest and Alaska all shifted pre-delivery payments worth hundreds of millions of dollars from 2016 into the final quarter of 2015. Scott Hamilton, founder of Bainbridge Island-based aviation-analysis firm Leeham.net, wrote that he knew of at least two lessors who also provided large advance payments in the final quarter of 2015. But how can it be sustainable to keep pulling money from future quarters? Doesn’t that inevitably mean less cash flow later? “But as long as … delivery rates are increasing, which drives higher cash, and orders are good, which drives higher advances … then they have this potentially to tap into,” he said. For now Boeing production just keeps climbing, and a solid global airliner market continues to generate plenty of orders. Last year, the company delivered a record number of airplanes — just over 800, compared with just over 700 four years ago and 600 six years ago — while booking nearly 900 net new orders. Boeing projected in late January it will build no less than 900 jets this year. The reason the market currently judges Boeing almost exclusively by its cash flow, not its profits, lies in Boeing’s complex accounting method for its decades-long airplane programs. Developing a new airplane costs from $10 billion to $15 billion upfront — or double that for a program that goes badly wrong like the 787 Dreamliner. That money has to be recouped gradually over the more than two decades that the airplanes are built. In reality, Boeing loses hundreds of millions of dollars on every airplane that rolls out in the earliest days of an airplane program, and then gradually ekes out a profit per unit until it’s making more and more on each plane. But this doesn’t show up as years of losses at the beginning, because Boeing doesn’t calculate the profit or loss on each individual airplane sold, but is allowed to smooth out the costs and profits over many years. For the 787, the costs and revenue are currently spread over 1,500 aircraft, of which fewer than 800 have been delivered so far. Back in 2011 when the 787 was new, the jet program was an enormous drain on Boeing’s cash. By now, eight years later, the 787 is generating cash for every one that rolls out, though Boeing is still working to recoup the deferred losses — sunk costs that at year end remained a deep hole of $25.6 billion. 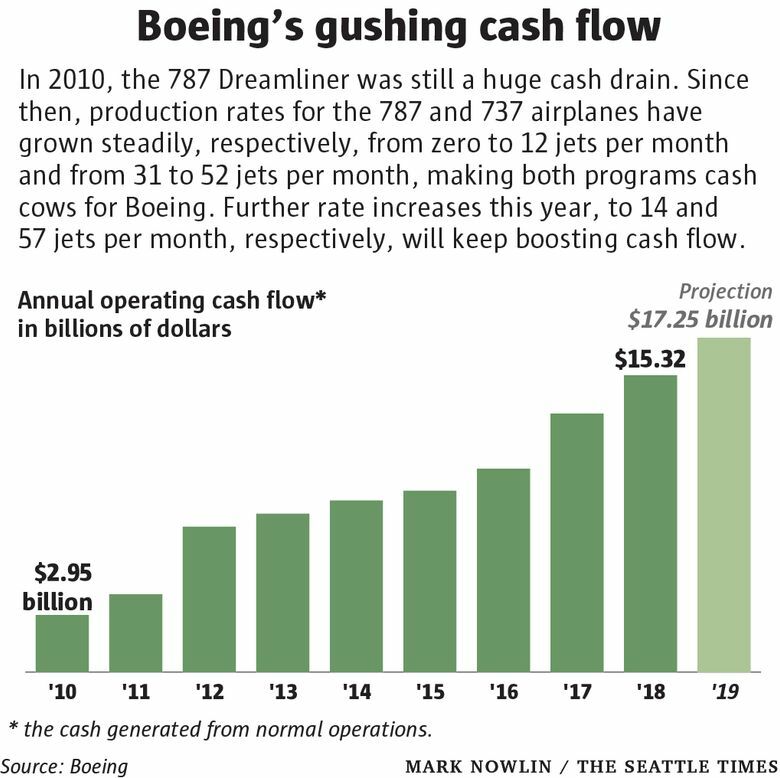 Though Boeing’s smoothed-out 787 profits don’t reflect this shift from a costly development program to a mature one raking in cash, its cash flow does, which is why the market focuses on that as a measure of how well Boeing is performing today. Operating cash flow swelled from nearly $3 billion in 2010 to more than $15 billion last year. CFO Smith on the January earnings call promised a “continued focus and effort to drive growing cash flows,” projecting that this year it will surpass $17 billion. Boeing, even with occasional production stumbles, is now harvesting its past investments in the 787 and 737 MAX in the form of that record cash flow. And global aviation’s current gangbusters business environment augurs continued fast-paced growth, providing lots of wiggle room to exceed Wall Street’s cash-flow expectations. Boeing Chairman Dennis Muilenburg insists that airplane manufacturing’s worldwide customer base is now so diverse that the business is no longer cyclical. If he’s right, Boeing may be able to keep accelerating cash indefinitely. But if a downturn hits as Boeing embarks on the huge investment of its next all-new airplane, its cash flow will be put to a more severe test.